A boy waits to get vaccinated at an anti-polio campaign in Moradabad, India. The world just took one step closer to eradicating its second disease. On Thursday, health officials declared India — and the entire Southeast Asia region — free of polio. And India's success against paralyzing disease is already opening doors for the massive country to stop even bigger problems. The whole community comes out during the polio vaccination campaigns. 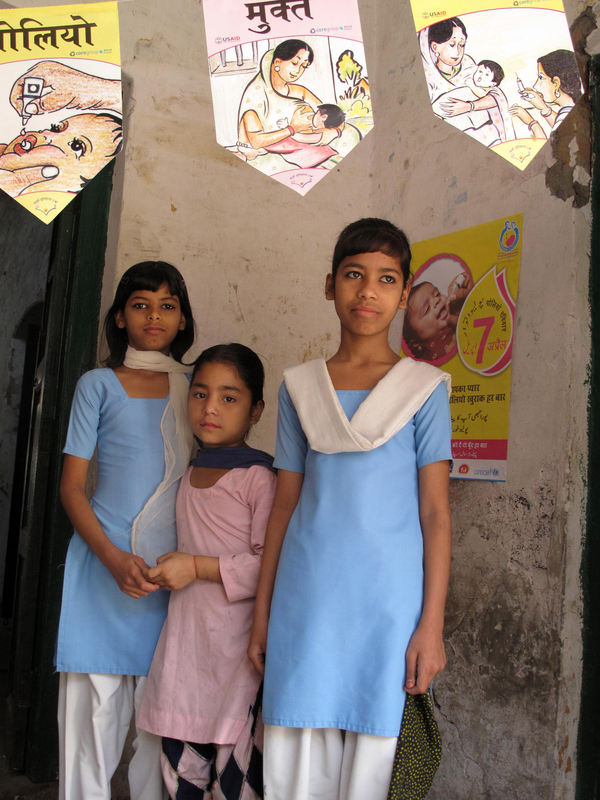 These school girls stopped by an immunization booth just to watch the action. Just a decade ago, many health leaders thought it was impossible for a massive country to end polio. Northern India was the world's epicenter of the disease. The region was reporting more polio cases than other. But due to relentless vaccination campaigns — and a flood of money from international foundations — India reported its last case of polio in 2011. "This was an enormous public health success," says epidemiologist James Goodson, with the Centers for Disease Control and Prevention in Atlanta. "It means that children and their parents no longer live in fear of that crippling disease in India." It also means that India, for the first time, has the tools and infrastructure to tackle other childhood diseases. At the top of the list? Measles. The virus is a big deal in India. An estimated 56,000 children died from measles in 2011 alone, which translates to about 156 deaths each day. "Fortunately, the measles vaccine is one of the most effective, and it provides lifelong protection from the disease," Goodson says. "But you do need two doses." That's been the problem in India. Babies have traditionally gotten the first dose of the measles vaccine when they get their other shots, Goodson says. But the government just didn't have a way to reach all these kids twice — until the fight against polio created a way. "Polio eradication uses mass vaccination campaigns," he says. "These social networks of volunteers and some paid staff are very helpful for making sure that all children come to receive the vaccination during those campaigns. "So now what we're seeing in India is that these networks are being retooled to fight measles," he says. At a vaccination drive in Moradabad, India, the transition to fighting measles is already apparent. At one immunization booth, health workers are giving babies two drops of the polio vaccine and then their second shot for measles. But ending measles is going to be a bit more challenging than polio, says Dr. Anisure Saddique, who directs the polio effort in the region for UNICEF. "Measles is not like polio, because the vaccine is an injectable. Anyone in just a half-hour training can administer polio vaccine," he says. "But for measles vaccinations, we need trained manpower and these health workers within the government [are] limited." Nevertheless, Saddique says that India's success against polio has motivated local governments to train more people and ramp up health care. "This whole polio program, actually, it brought public health on the focus," he says. "All the health workers are known by the community, so there is a huge demand."